Book Steve to deliver an inspiring, motivating and actionable talk on corporate innovation and entrepreneurship at your organisation. Steve regularly delivers keynote talks and has graced the stage at CPA Congress 2016, HRx, PauseFest, Future Assembly, IBM Symposium, Spigit Innovation Forum, NAB, ANZ, Bupa, Australia Post, Downer Group, CapGemini, VicRoads, CarSales and City West Water. 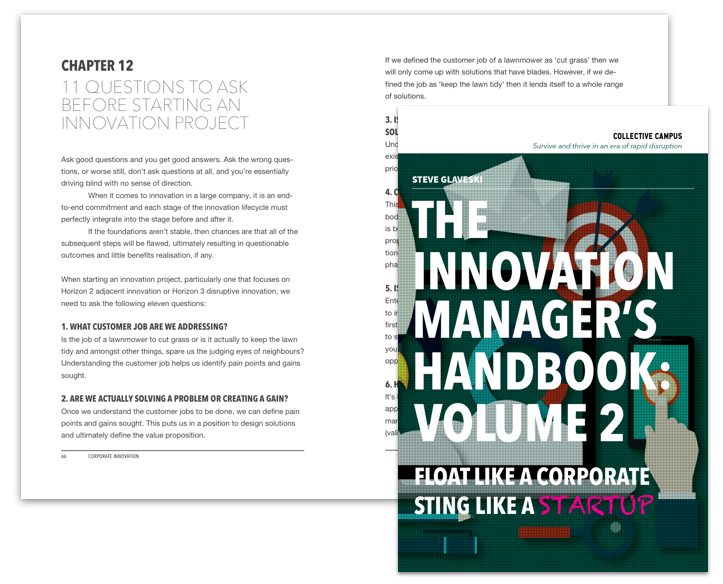 If you’re frustrated with the pace of innovation in your business and want the inside track on how to establish, drive, measure and deliver meaningful innovation, the Innovation Manager’s Handbook series is for you. Steve Glaveski has reflected on his experience running Collective Campus and interviewing hundreds of thought leaders for the Future Squared podcast on the topics of corporate innovation, entrepreneurship and self improvement, distilling key takeaways into bite-sized actionable insights for the reader. Learn how to drive corporate innovation initiatives successfully and avoid the pitfalls that most organisations fall into when engaging in what Glaveski calls ‘innovation theatre’. Steve provides a proven pathway for large corporates to be able to derive the innovative benefits of a start-up culture. In this book, Steve Glaveski takes the reader on an innovation journey like no other. Like an experienced innovation safari guide, he points out the most important lesson along your path and tells them in an insightful and entertaining way like no other. 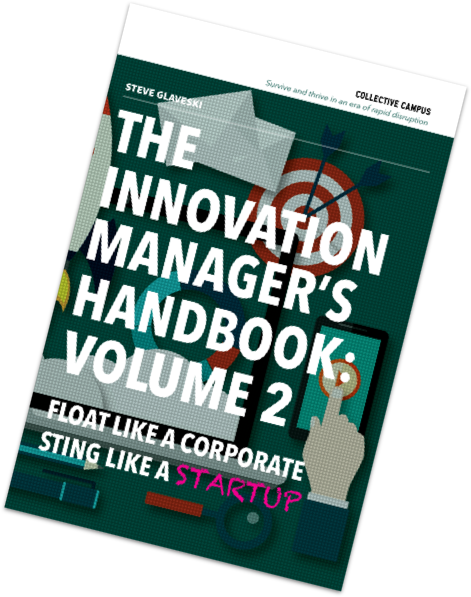 An essential addition to anyone wanting to improve their innovation success. I connect strongly with Steve Glaveski regarding the avoidance of innovation theatre, grand displays drawing hype and attention with little substance or return after the fact. I think you will find the needle on your organisation’s culture, idea generation and return on innovation investment shifts positively as you apply the ideas and tactics he describes... Dive in. Learn how to maximize your investment in innovation. Enjoy the read. JOIN THE BOOK LAUNCH PARTY! Come and party with the team at Collective Campus as we celebrate the release of our CEO and Co-Founder Steve Glaveski's new book! Not only can we ensure a night of networking, drinks, nibbles and music capped off with a talk from Steve, but you will walk away with your very own signed hardcopy of the book, worth $14.95! Steve Glaveski is an entrepreneur, keynote speaker, podcast host and author of the Innovation Manager's Handbook series.. He is the Co-Founder and CEO of Collective Campus, an innovation hub, school and consultancy based in Melbourne, Australia and Singapore that works with large organisations to help them adopt mindsets, methods and tools to successfully explore new business models in an era of rapid change. More recently, Steve founded Lemonade Stand, a children's entrepreneurship program for 9-12 year olds that teaches them the fundamentals of design thinking, the lean startup philosophy, coding and developing augmented realities. The program has been rolled out across Australia and Singapore to over 1,000 children.